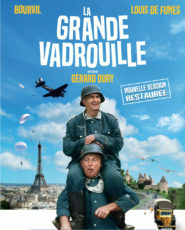 “La Grande Vadrouille” as a grande finale! We are proud to announce the film that will close the 2nd edition of Vélo Paradisio: La Grande Vadrouille! In 1942, an English plane was shot down by the Germans over Paris. The three pilots parachute and land in different parts of the capital. They are helped by two French civilians, a conductor and a house painter who agree to take them to the “free zone”; they thus become, in spite of themselves, actors of the Résistance. Screening will start at nightfall! Article suivant Here it is: the Velo Paradisio program! !